WASHINGTON — The National Space Council will hold its next public meeting March 26 to discuss NASA’s human space exploration plans. The council is slated to meet on the afternoon of March 26 at the U.S. Space and Rocket Center in Huntsville, Alabama. The meeting will be the fifth for the council since it was reconstituted in 2017, and the second outside of the Washington, D.C., area. One panel, titled “Ready to Fly,” will feature retired Air Force Gen. Les Lyles and former astronauts Eileen Collins and Sandy Magnus. 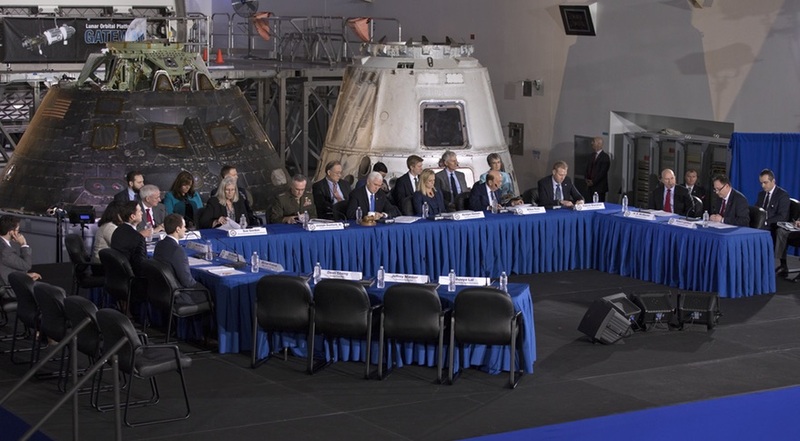 Lyles and Collins serve on the National Space Council’s Users’ Advisory Group, which last met in November to discuss, among other issues, the status of NASA exploration planning. A second panel, titled “Ready to Explore,” includes Dan Dumbacher, executive director of the American Institute of Aeronautics and Astronautics and a former NASA official involved in exploration planning; Jack Burns, a University of Colorado professor who served on the NASA transition team for the incoming Trump administration; and Wanda Sigur, a former Lockheed Martin executive. The meeting comes as NASA is in the midst of a short-term study on the feasibility of moving Exploration Mission (EM) 1 from the Space Launch System to commercial launch vehicles. That alternative approach, announced by NASA Administrator Jim Bridenstine at a March 13 Senate hearing, is intended to keep the mission on track for a June 2020 launch given anticipated additional delays in the development of the SLS. Bridenstine tweeted March 15 that, since announcing that study, NASA and Boeing teams “are working overtime to accelerate the launch schedule” of SLS. He added that SLS remains the “preferred option” for EM-1. Neither NASA nor Boeing, the prime contractor for the core stage of the SLS, have elaborated on what’s involved in that effort or why it was only being done now.